Chinua Achebe is a titan of African literature who lives a quiet life in upstate New York. Pangea World Theater is a small, ambitious Minneapolis company interested in humanitarian issues. Somehow, the two connected; Pangea will produce the world premiere of the stage adaptation of “No Longer at Ease,” Achebe’s landmark 1960 novel about the conflict between tradition and modernity. For Pangea, which has staged such heavyweights as “Ajax,” “Rashomon” and Athol Fugard’s “Playland,” this is another opportunity to tackle a world classic. Set on the eve of Nigeria’s independence from Britain, “Ease” revolves around Obi, a young man whose Ibo people have raised money to send him to school in England. After completing his education — he becomes a poet instead of, say, an engineer — he has returned, full of idealism. He is eager to help usher Nigeria into a new era. Obi confronts the deep-seated traditions of his countrymen. His mother would rather commit suicide than permit him to marry the woman he loves, who is from a class of untouchables. The ethically and morally upright Obi eventually succumbs to the things he condemns: He takes a bribe and is arrested. Securing the rights to stage this world premiere was the easy part for Pangea’s creative team. Through a mutual friend, the company got in touch with Achebe, a professor at Bard College in New York. Natarajan then made contact with Achebe’s agent in London. The hard work was narrowing a sprawling, epic novel for the stage. E.G. Bailey, who adapted the book, and director Dipankar Mukherjee use 11 actors, many in a chorus, to play all the parts. Bailey, a Liberian-born poet, playwright and performance artist, had other challenges while working on “Ease.” Shortly after he did a first draft of the play in June 1999, he returned to his homeland for the first time since his youth. Bailey and Mukherjee brought in leaders of Twin Cities Nigerian organizations to work on accents and to talk about the play’s themes. The Pangea creative team discovered many complexities; for example, the bribery that is so pervasive in the book and in much of contemporary Africa is rooted in a benign traditional practice of gift exchange. Bailey and Mukherjee also delved into the conflict of values that Obi embodies. Because of his English upbringing, Obi sees bribery as more of a crime than abortion. When his girlfriend — the same one his mother has forbidden him to marry — becomes pregnant, he seeks money for an abortion. The play’s conflicts have universal applications, Mukherjee said. “We’re talking about Nigeria as much as India,” he said. “In both cases, different mini-states were forged together into a nation, and the traditional values continue to clash with the legacy of colonialism and the possibilities of the future. What: Adapted from Chinua Achebe’s novel by E.G. Bailey. Directed by Dipankar Mukherjee. When: Opens 7:30 p.m. today. Runs 7:30 p.m. Thu.-Sun. Thru May 27. Where: Waring Jones Theater, Playwrights’ Center, 2301 E. Franklin Av., Mpls. 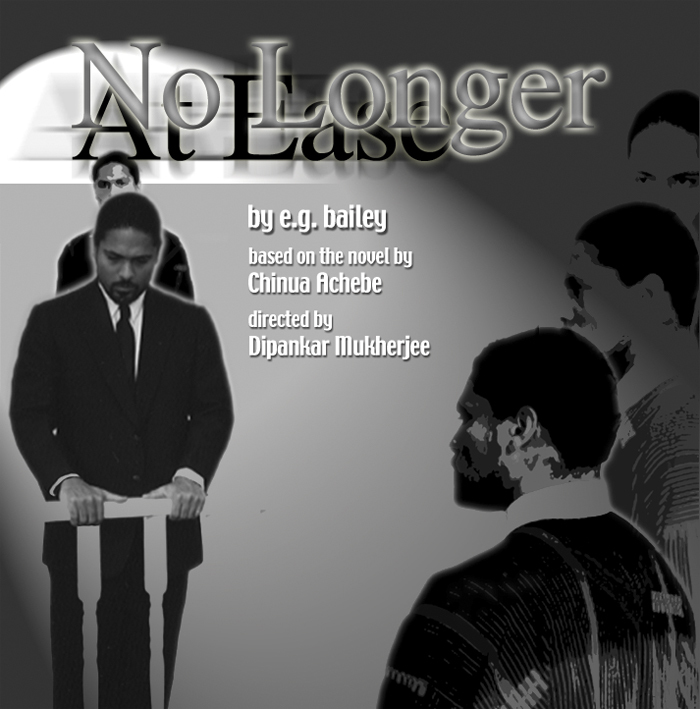 If you like economical and evocative theater, go see “No Longer at Ease,” Pangea World Theater’s adaptation of Chinua Achebe’s novel. As adapted by E.G. Bailey and directed by Dipankar Mukherjee, this “Ease,” in a premiere at the Playwrights’ Center in Minneapolis, captures the big themes and epic arc of Achebe’s work but little of his wry humor. The brisk 21⁄2-hour drama veers from haunting ritual to heady realism, mixing these realms with a wonderful, no-fuss theatricality. Set on the eve of Nigerian independence, the action involves Obi Okonkwo, a headstrong young man who has been sent away to school in England by his Ibo people. After four years abroad, Obi (the reverse of Ibo) returns westernized and scornful of his people’s traditions. His family forbids him to marry his girlfriend, Clara, who is from a group of outcasts. Obi moves in with her instead. When she becomes pregnant, Obi takes a bribe so he can pay for an abortion. He seems no different from the corrupt officials he condemns. The action plays out on Seitu Jones’ striking, museumlike set. It is lined with elaborate carved African artifacts and furnishings, as well as 11 mainsail-style backdrops behind which the actors retreat. Sarah Schreiber’s expert lighting transforms the space from office to nightclub to home. In the ritualistic scenes, imaginatively staged by Mukherjee, the broad themes are more important than the individual character development at the heart of most Western drama. The show is at its best during the stylized scenes. For example, when Clara goes to have the abortion, she meets resistance from the whole community, lined up on one side of the stage. In half-shadows, the hissing, gasping townspeople walk in slow motion, pushing out at her as if trying to stop a car with bare hands. From the other side of the stage, Clara pushes until the two sides meet — and cross — at a threshold. Then the scene dissolves, the lights brighten and the pace returns to normal. Mukherjee’s sensitive treatment of this section is a highlight. By contrast, the realistic scenes are more predictable, and while those involving the conflict between European colonizers and African subjects may be historically accurate, they sound stilted. Actor James Young II plays Obi like an ornery prizefighter. He comes on at full throttle for most of the show, his passion loud and clear. Young’s bombast is somewhat moderated by the company of actors around him, including Gregory Stewart Smith, who plays Obi’s brother and a host of other roles; Ronnell Wheeler as a ritual dancer and conspirator, and Marie-Francoise Theodore, who gives a knitted-brow innocence to the underwritten role of Clara. — Rohan Preston is at rpreston@startribune.com . * Who: Adapted from the Chinua Achebe novel by E.G. Bailey. Directed by Dipankar Mukherjee for Pangea World Theater. * When: 7:30 p.m. Thursday through Sunday, through May 27. * Review: This brisk, 21⁄2-hour drama about Nigeria on the cusp of independence veers between stylized ritual and heady realism, blending these disparate realms with a wonderful, no-fuss theatricality. * Tickets: $14-$16. Call 612-343-3390.